Our updated classic Santa Maria Style Bourbon BBQ Glaze Homemade Recipe made with authentic ingredients. Our Bourbon BBQ Glaze recipe shows you steps to make this BBQ Glaze. To help out the many requests we receive for our Tri Tip barbecue recipe and Bourbon Glaze we have created two videos. 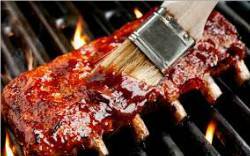 The videos are designed to show step by step instructions for making each of these popular BBQ Recipes. Our Bourbon BBQ Glaze recipe is the perfect accompaniment for chicken, ribs, tri tip, steaks, lamb and more. The Glaze uses Jake's Maple Bourbon BBQ Sauce which is filled with non-alcoholic Natural Bourbon and Maple flavors. 2. Add the 2 Medium Onions Minced, sauté for 5 minutes or until Onions turn golden in color. 3. Add remaining ingredients into the sauce pan; reduce heat to low and cook until mixture thickens about 30 minutes stirring frequently. When the glaze reaches your desired thickness you can let the ingredients cool for 5 minutes then spoon directly on your meat. For thicker glaze just continue reducing ingredients for an additional 15 to 20 minutes. Serve with BBQ meats or with tacos or wraps as desired.